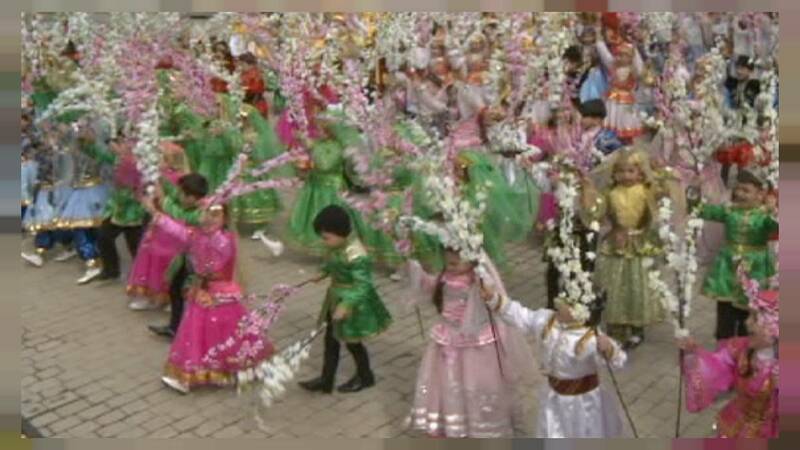 Dancing in the streets, resolving quarrels and paying tributes: Novruz, the spring festival of Persian origin, has been celebrated for over three millennia. Inaugurating a week-long public holiday, Baku, the capital of Azerbaijan turns into a center of festivities with a spectacular show of arts and crafts. “The people of Azerbaijan are famous for their traditions, and among these traditions the celebration of Novruz certainly holds a special place. It is a festival that exists since prehistoric times. People have always celebrated the rebirth of nature, the reawakening of life. That is why since ancient times, this tradition lives within our people, in genetic memory. Even when there were times when we were forbidden to celebrate the holiday – nobody complied,” says Azerbaijan’s Minister for Culture and Tourism Abulfas Garayev. At a short distance from Baku is a quiet wonder of nature: the Fire Mountain – a hill engulfed in flames of continuously escaping natural gas. “Yanar Dagh is always ablaze – in any weather, be it rain, wind, or even snow – it never goes out… This flame is a sacred national symbol of Azerbaijan. The word “Azerbaijan” itself means the “land of fire”, and fire-related symbolism is an important integral part of Novruz,” says the guide at the Yanar Dagh state reserve Matanat Nabiyeva. For thousands of years, the land of fire has been a melting pot of various cultures and religions. All the way through their history, the Azeri people carried on the ancient traditions of their fire-worshipping ancestors. Long before Christianity and Islam, Zoroastrianism was the philosophy in this region. The ancient Fire Temple witnessed the golden age of this religion whose prophet Zoroaster is believed to have invented Novruz. “The modern Novruz festival which we celebrate nowadays goes back to ancient times, to the first origins of the Zoroastrian religion. A lot of the Novruz traditions have remained since then. Of course, for Zoroastrians the fire was a way of communion with God, whereas for us it has simply become something sacred that links us to the distant past,” says the director of the Ateshgah Fire temple Rashid Babai. This cultural significance has recently been recognized by UNESCO. It addeded Novruz, a multi-ethnic spring celebration, to its List of the Intangible Cultural Heritage of Humanity. “Embodied in this festival is the spirit of a fair, of farce – good-natured farce. The organisers of the celebration are trying to preserve its traditional features – despite the obvious difficulties, considering that folk art never survives in its pure and original form, but rather keeps evolving and changing all the time,” says UNESCO’s Sanubar Bagirova. A genuine folk custom, it is also a gastronomic feast: holiday specialties are an essential attribute of Novruz. “This is one of the best and one of the most delicious holidays celebrated in Azerbaijan. Our menu is mostly based on a large assortment of pilafs and kebabs, but just for this holiday we extend it with traditional sweet pastries and dried fruit. It’s very beautiful, very tasty – and, well, very rich in calories,” says the Mugram Club’s artistic director Afag Gaziyeva. “People ignite campfires in all the yards, and family members join hands in a dance – and then jump over the fire, saying: ‘in this fire we throw all our misfortunes’”.